I spent barely an hour on Centre Court on Tuesday as I ended up watching plenty of tennis on the outside courts. There’s so much to see and you never have a problem getting a good view. I also watched Barbora Strycova v Sara Errani which was magical and you can see all my photos for that match HERE. Here are my photos from the rest of the matches I watched on the outside courts. I watched the first set of this match and it was a high quality set with plenty of winners. Casey held her own early on and it was just one break of serve that separated the pair. 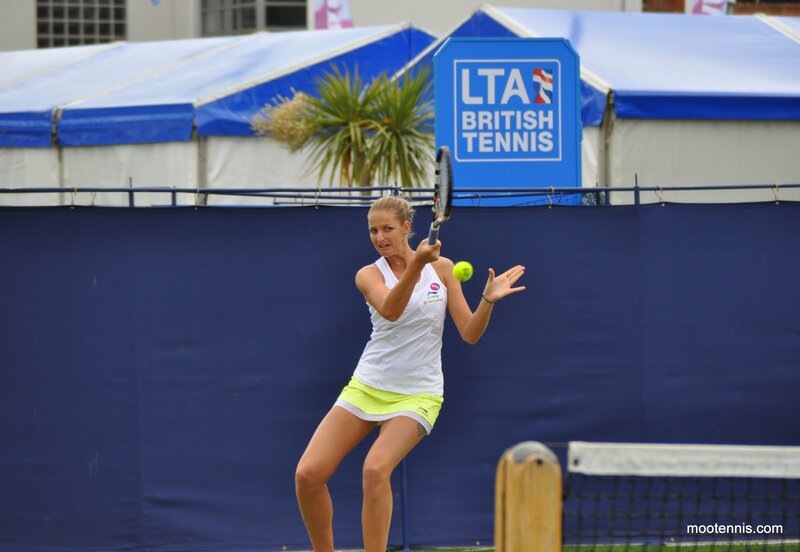 Pliskova served it out with a superb game, finishing with a number of aces/unreturnables. Watching Pliskova live is a treat. Her power is quite something to witness in person and her nonchalance about it as well. She ripped a number of stunning backhands down-the-line. 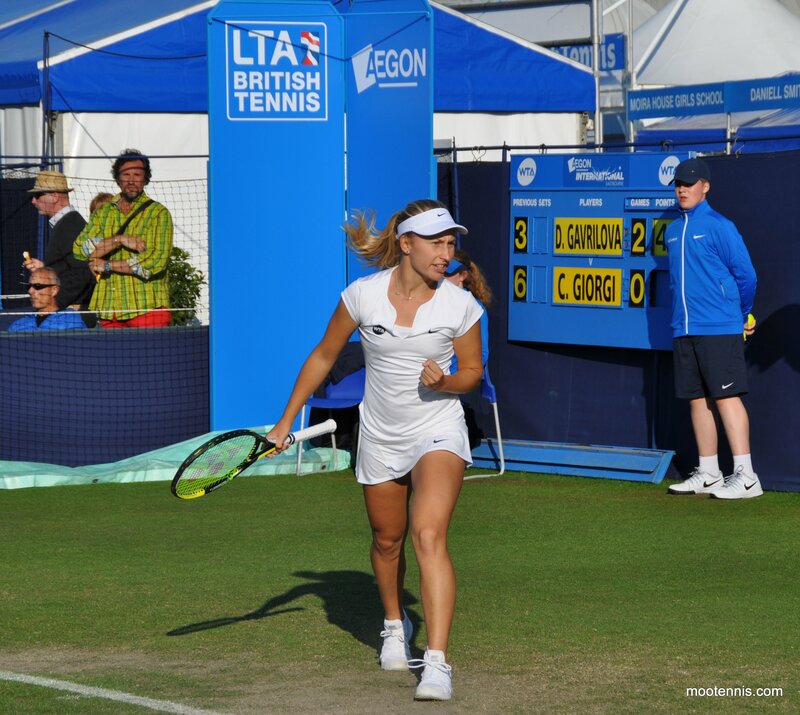 Gavrilova-Giorgi was a perfect way to end my Eastbourne trip this year. It was a thoroughly entertaining match which I joined immediately after Strycova-Errani. Giorgi dominated the opening set as she overpowered Gavrilova from the baseline. Gavrilova is hilarious to watch. I already knew this after watching her qualifying match against Erakovic (see full match recap here). There were loud come ons, even on Giorgi double faults, allezs, loud grunting and constant muttering. After one Giorgi ace, I heard Daria say “f****** shank serve on the line”. In the second set, Gavrilova went up 4-1 but lost her early break. She kept digging away though and played an excellent service game at 5-5, holding to love with some great serving. The set went into the tiebreak and Gavrilova was the one I couldn’t take my eyes off. After one Giorgi first serve that went out, she started fist pumping and saying “come on” and “I got this” or words to that effect. 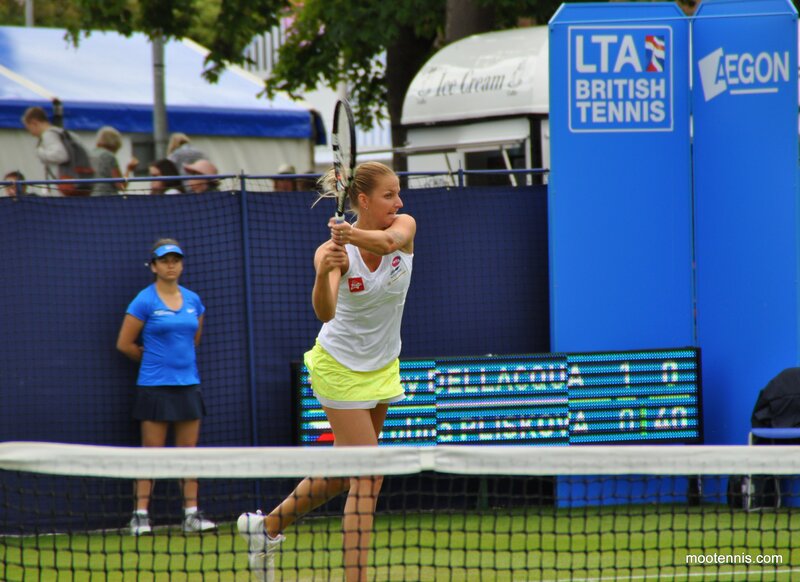 Giorgi still had the edge and earnt a match point. I wish everyone could have seen this point because it was INSANE. Giorgi kept powering deep bullet groundies and Gavrilova did so much running from side-to-side, soaking up the pressure. There was one shot that Giorgi hit in the rally that was very close to being out. Gavrilova won the point though, celebrated loudly and then screamed “THAT BALL WAS OUT!”. Gavrilova eventually won the set with a loud squeal. Daria’s attitude fluctuates from good to bad to really bad. 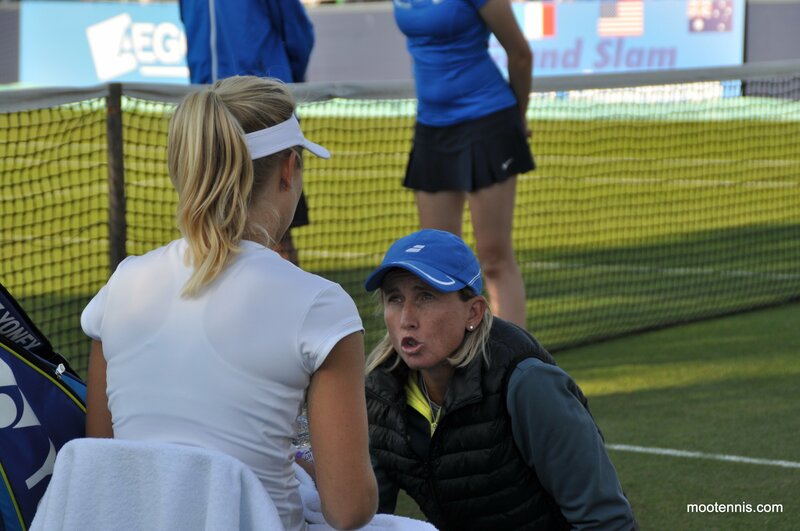 At one point her coach, Nicole Pratt said “it’s OK” to which Gavrilova responded loudly “it’s not OK”. However, she managed to harness it in a good way in the second and third sets and use it it to her advantage. Gavrilova is one player that will divide fans, but I gained a lot of respect for her with the way she turned the match around with pure pluckiness. Sergio was also there at the match and you could hear him regularly. It sounded like he kept saying “Elena” whenever Camila played a good point. Giorgi collapsed a little in the third set with too many errors. 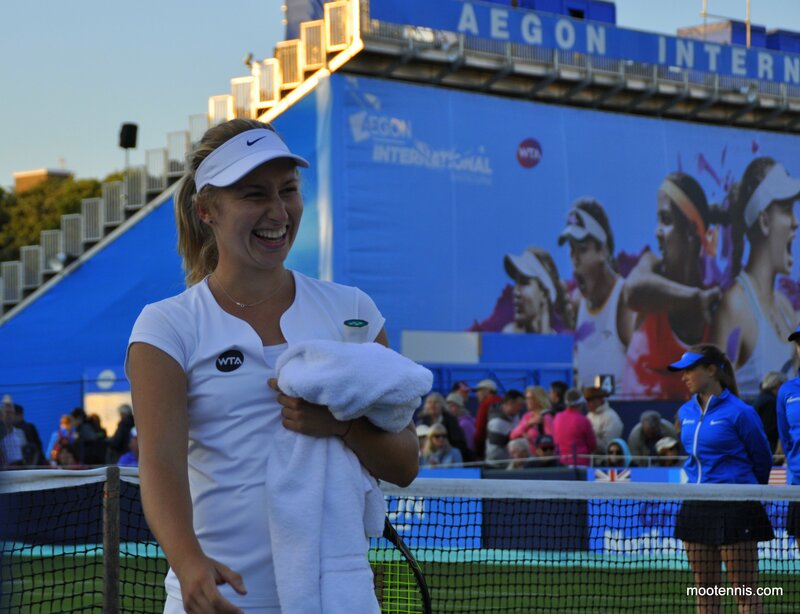 Despite failing to serve out the match, Gavrilova broke to claim a fantastic win. The hard work had been done in the second set where she seemed to break Giorgi’s spirit. The handshake was a bit brief. 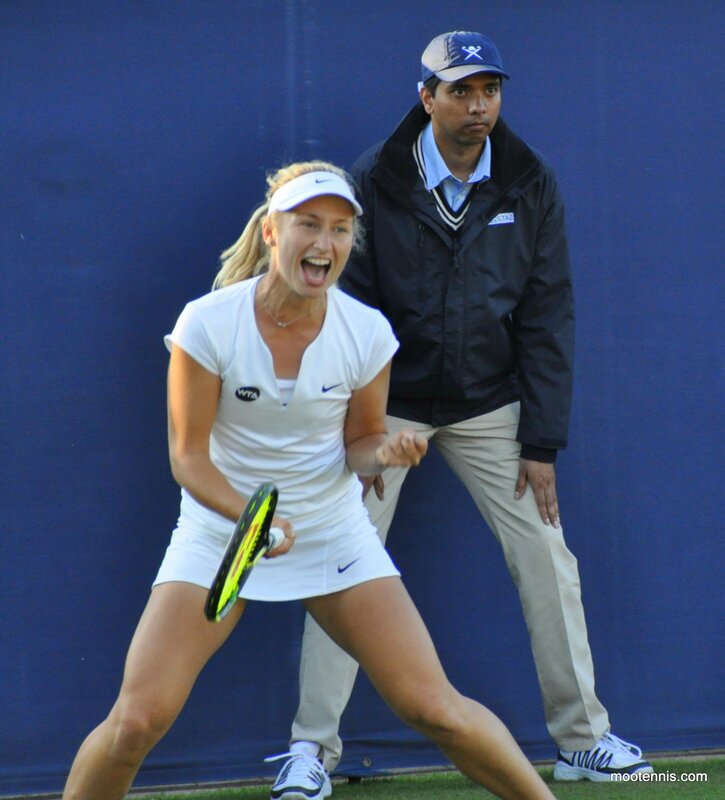 Gavrilova was understandably thrilled at the end. She did a little dance. A guy came up to her and said well done on such a good match and that he thought she could win this tournament. Thanks to @roobynVC and @pearlescent48 from Twitter for their company during the match, which made it all the more memorable. I was so cold at the end but it was totally worth it! 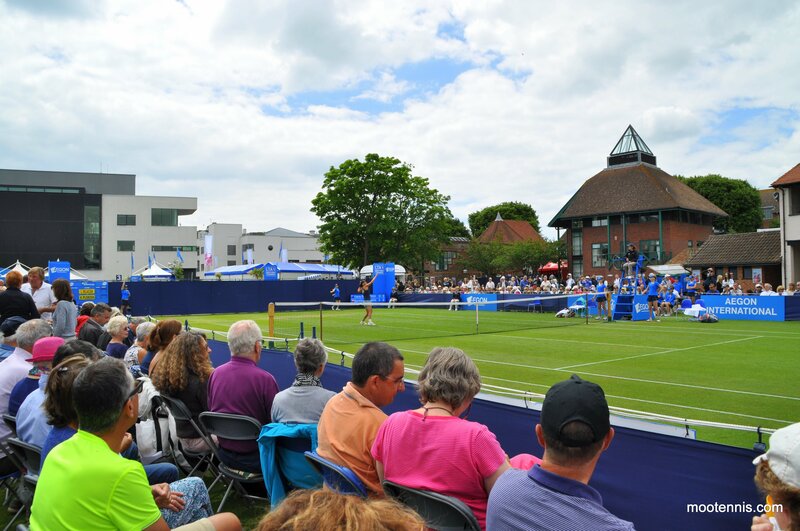 June 24, 2015 in Dellacqua, Eastbourne, Gavrilova, Giorgi, Ka. 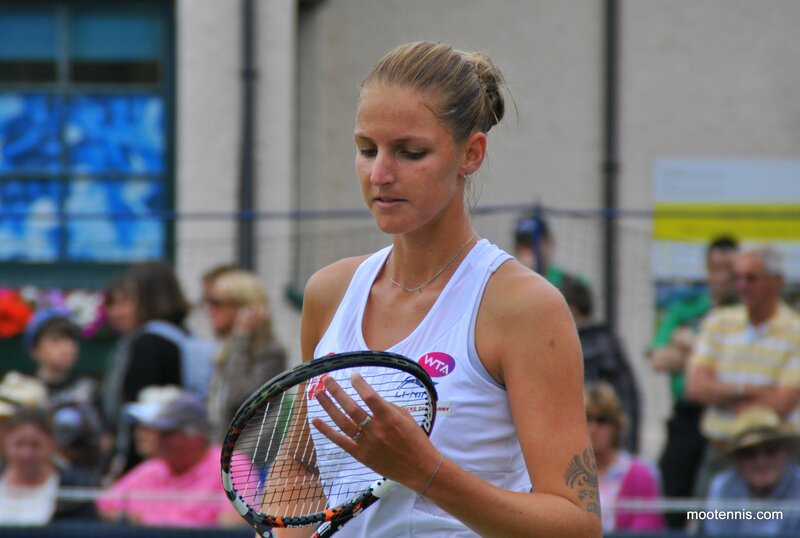 Pliskova, WTA. 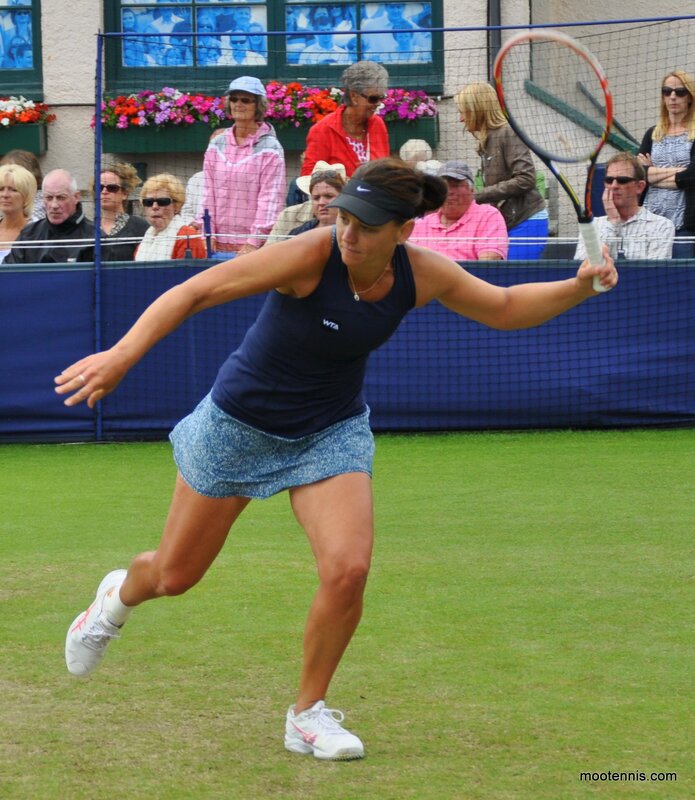 I followed that match on Twitter,as I could not find a live stream,thanks for your report James!,Daria plays with a lot of passion,I agree some fans may or may not find that very endearing:).I like that fact she dosent go away in matches,thrilled she has made the q/finals at Eastbourne this year.